The following post contains spoilers for Stranger Things Season 2. Beware if you haven’t seen the whole series yet. If you’re up to date or don’t mind, then read on, brave one. It’s the season’s main threat, and is a lot more nefarious than any mere Demogorgon. 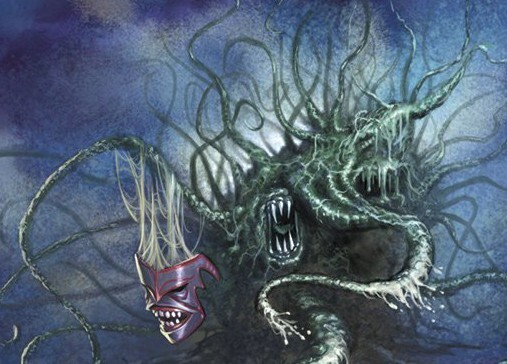 While the Dungeons & Dragons analogy of the Shadow Monster is the “Mind Flayer,” deemed as such for its ability to tap into and control human minds, there’s also another great point of reference in the deity mythos of H.P. Lovecraft: the Nyarlathotep. Wherever Nyarlathotep went, the inhabitants’ sleep would be plagued by vivid nightmares. The story ends by describing horrific, surreal vistas experienced by the party, in which they realize horror and doom have come to the world. Doesn’t sound too dissimilar to what Will Byers sees in his now-memories in the first several episodes, nor does the visage of the faceless, massive spider thing to the most common visage of Nyarlathotep’s true form. Lovecraft’s evil deities are enormous and monstrous but are often also mentally devastating, and none embodies that more than Nyarlathotep. Similarly, while the first season of Stranger Things had a monster from the Upside Down that was hulking and brutal, the second season gave us one that struck fear into young Will Byers’ heart and tore his sanity asunder. The Shadow Monster is definitely this year’s big cosmic bad, and ol’ H.P. would be proud. Let us know your thoughts about Stranger Things season two in the comments below!